Otherkin might be a term you heard from Tumblr. Maybe you already dismiss the idea because you dismiss anything you read on Tumblr. Maybe you don't really know what it is. Otherkin folk do not identify as animals—that's another term entirely— but they do identify as mythical creatures. For example, otherkin might identify as fairies or dragons. It could be harmless; perhaps a young teenager identifies as otherkin. Sure, it's a little weird, but a young teenager is still a child. I know I had a friend that was twelve years old and considered herself a fairy. A year later, she denied she ever said it. However, an adult claiming to identify as otherkin could be harmful. It could be a debilitating delusion. Those who identify as animals are called therian. Some might actually try their best to live as an animal. Again, children and young teenagers that identify as therian probably aren't serious about their identity; these young kids are playing make-believe or pretend. Or maybe the best way they can relate is by claiming their identity as an animal. That is alright because they are children. They have yet to understand how to better articulate what they mean and how to separate play from reality. However, an adult wearing a tail and cat ears while claiming she was born a cat is highly disturbing. People attribute attitudes and qualities for animals; none of us know for certain what an animal is truly thinking or why they do what they do no matter how much they studied them. Therefore, an adult attempting at living as a different species is only imitation. Both of these so-called "identities" are harmful and insulting when discussing their validity in the same vein as the gender spectrum's validity. I am not going to argue the validity of gender identities because I personally believe there is no argument there. An individual assigned female at birth can physically transition to a male; he can transition physically to match the gender he identifies as. An individual may have an anomaly within their chromosomes, but might identify as a different gender than they were assigned at birth as well. Perhaps they identify with their assigned gender. Or maybe they identify as agender, which is no gender. How? Because gender is a social construct. Gender identities, so long as they remain tethered to human gender, are valid, in my opinion. 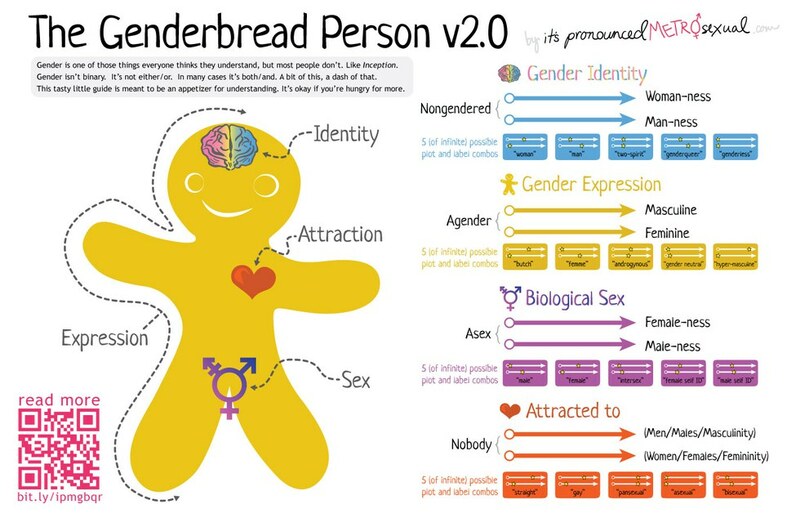 The Genderbread Person image below best categorizes gender identity and expression on a spectrum.